Romaine's blends sophisticated dining with a warm 'welcome to my home' southern feel. Chef/Owner Richard Romaine and his wife Erin opened their creative American restaurant four years ago in the largely untested waters of the metrowest area just outside Interstate 495. The response has been phenomenally positive. Richard's experience working with many different types of cuisines, combined with his Cajun roots, has allowed him to create a menu deliciously fitted to his well-seasoned style. 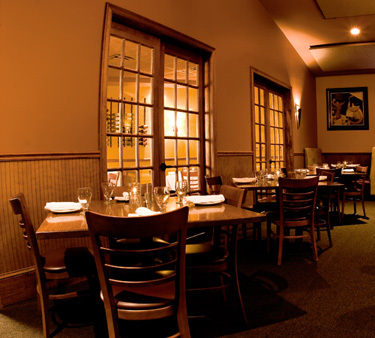 Romaine's decor is open, but the warmly colored walls and brick oven create a cozy, intimate feel in the comfortable dining room. The rich hues - maize, rust and azure - are a visual complement to the vibrant food and atmosphere. Romaine's also has a private dining room that seats up to 52 people and a spacious bar staffed with some of the area's greatest bartenders.